Marketers and advertisers spend a great deal of time designing and evaluating campaigns. We worry about what makes a campaign a breakout star, and how to achieve more of those. 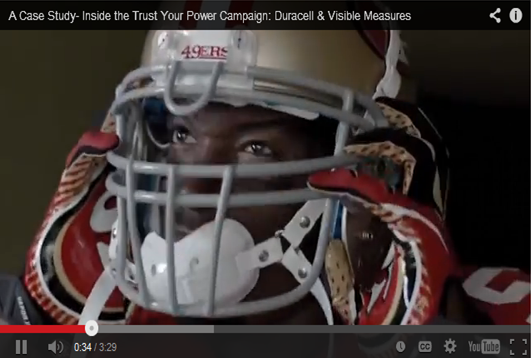 In this video case study from Visible Measures, Proctor and Gambles’ Duracell team describes the strategy behind its campaign Trust Your Power, starring 49er football player, Patrick Willis. The team also illuminates how it develops shareable content and approaches paid, earned, and owned media. The process started with selecting a spokesperson that could establish the value of the brand and reinforce the brand message of the product. In the Duracell case, the attributes desired for the endorser were powerful, dependable, and heroic. The content also needed to be sharable and creative, with a message that viewers would want to pass along. For Duracell, the spokesperson became NFL Seattle Seahawks player Patrick Willis who discussed how his disability – a hearing loss since age three – only helped to fuel his determination and drive to succeed. Watch the video and determine how this strategy can be replicated for other brands. 1. Show the Duracell commercial: http://youtu.be/u2HD57z4F8E. 2. Make sure to look at the comments posted by viewers. How many were positive comments? 4. Divide students into groups and have each team select another product where this approach could be replicated. Have teams storyboard a video for the product. 5. Debrief by putting together the suggested storyboards on the white board and discuss with the class.